Inkin' It Up With Kendra! : Day One - Kraftin' Kimmie July Release Peek!! Hey everyone!! Welcome to day ONE of our JULY Kraftin' Kimmie Peeks!!! We have so many goodies in store for you and we've been itchin' to share them! So here we GO!! We are SO thrilled to share the newest set of furry friend stamps from artist THAIS NARCISO! This super sweet set is called A KOALA-TY FRIEND!! Are you planning to join us for our LIVE ONLINE RELEASE PARTY?? Hope you can join us for all the fun and excitement and prizes on Saturday night beginning at 6pm EDT!! Hope you can come hang out with the Krafty Girls and Guests! 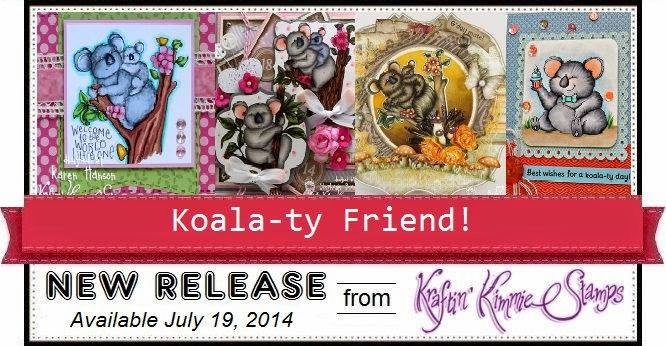 Here is the card I designed using the cutie patootie A Koala-Ty Friend set.....the Koala with a Cupcake - soooo cute! Love this! The background cupcake paper is some that I picked up at Hobby Lobby and I'm thinking I should have gotten a lot more! :) I got my color combo inspiration from the paper and WOW, I just love it - will definitely be using this a lot more! I used my Prismacolor Pencils/Gamsol to color the image. Have fun hopping around to all the rest of the Krafty Girls! Congrats on your Guest spot at Kraftin' Kimmie. Love what you've created...such a cute image and wonderful colours. this is a very Wonderful creation using this oh so cute new stamp set!!! Too cute. I love the fun colours in your card. Great job. Adorable card. Love your coloring. Beautiful card ,I like his design. Beautiful festive card. Love it! now that's a festive little birthday card! love the light and bright colors! So pretty. Love the little banner and the flower. Great card. Such a fun card! Really made me smile. Thanks! I love the bright colors on this card. Your card is so sweet! Perfect for a birthday party! Love the colours! What a sweet card!! so nicely colored and designed! I can see why this koala is so happy - holding a sweet treat that he knows will taste wonderful! Great card and awesome designing. Super Awesome card. Congratulations on the Krafty Guest. SOOOOOOOO cute! Love the bright colors and the banner. This is a great card! I love all the details and pattern paper you added!